Born in 1940, John saw a lot of the world courtesy of the US Navy and careers in electronics, aviation, and the oil patch. 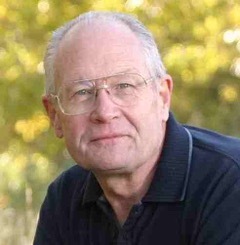 John is he author of an adult mystery, The Kitten Burglar, released in November, 2009. He is also the vice-president of Writer's Ink, the Red Deer and district writer's club and a member of MENSA, IONS, and The Orchid Society of Alberta. John's interests are Paleontology, Astronomy, Comparative Religion, Cosmic Evolution, and — of course —writing. John still marvels at his good fortune: While many men spend their entire lives searching for the right woman, John has enjoyed the love of two fine ladies. In a time when many people have strained relationships with their children, John can say that his three grown daughters are his best friends.